Butternut squash is a type of winter squash native to the Americas. Technically a fruit, it has long been utilized as a complete source of vegan protein by native populations when also paired with corn and beans. Together, the three are referred to as "The Three Sisters" and are a common sight in autumn. Butternut squash makes a great addition to many sweet and savory dishes alike. It is a potent source of vitamin C and other nutrients. A high-carbohydrate food, it nevertheless has a low glycemic index. Butternut squash is a good source of dietary fiber, providing you with more than 25 percent of your daily needs. It is full of healthy, complex carbohydrates and has a low glycemic index of just 51, making it a filling option that most can regularly incorporate into meals. Butternut squash is a great choice for people on low-fat diets, containing almost no fat whatsoever. Butternut squash makes for a filling vegan protein. The seeds, dried or roasted, also contain protein and can serve as a very filling, nutrient-dense snack. Butternut squash is a source of 9 percent of your daily recommended amount of vitamin A. It is also a source of thiamin, pyridoxine, calcium, potassium, magnesium, and manganese. Vitamin A is essential for proper organ function and optimal vision. The B-vitamins thiamin and pyridoxine help your body convert nutrients into energy. Calcium and potassium are important for muscle function. Magnesium and manganese are needed for the various chemical reactions in your body. Butternut squash is an excellent source of vitamin C, containing 87 percent of the recommended daily amount in just one cup. Vitamin C is necessary to the production of collagen, the main protein in your skin, as well as for the production of certain neurotransmitters. Vitamin C may have a therapeutic role to play against neurodegenerative diseases involving high levels of oxidative stress. Squash has been found to be helpful in reducing the risk of heart disease and hypertension because of the anti-inflammatory actions of its polyphenolic compounds. 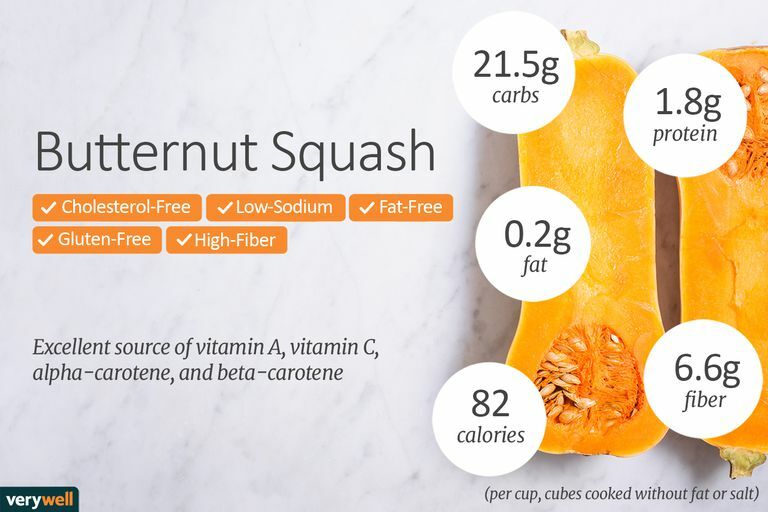 One cup of butternut squash contains 39 percent of your daily recommended amount of iron, a mineral that is essential for cognitive development. Iron supplementation can reduce anemia, a factor in maternal and neonatal deaths worldwide. Can I eat butternut squash skin? It is better not to eat the skin, as it is hard and unpleasant. Butternut squash can be a pain to peel, so opt to cook it with the skin on. The meat will more easily fall away afterward. Can I eat butternut squash raw? You can, but cooking the squash can increase its nutritional value and soften the flesh, making it easier to consume and digest. Because squash takes on many different flavors, it is tastier when cooked. Butternut squash can be roasted, baked, puréed, or sautéed. You can also mash or steam it and add it to soups, stews, and chili, or stuff squash with whole grains or legumes for a nutrient- and protein-packed vegetarian meal option. Baking butternut squash with some unsaturated fat, such as grapeseed or canola oil (they have higher smoke points than other options), can enhance the absorption of vitamin A. This roasting technique will caramelize butternut squash's natural sugar for better flavor. There is a known butternut squash allergy leading to contact dermatitis of the hands that affects some people when they peel and cut up the squash. If you know you have this sensitivity, wear gloves during preparation.